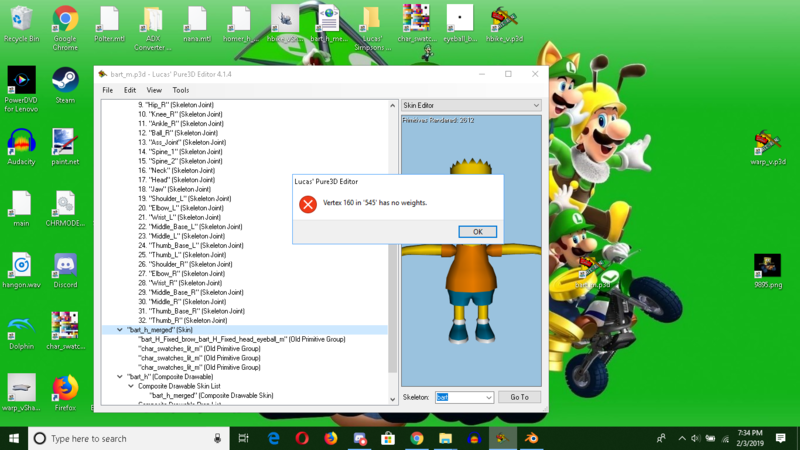 I plan to port characters and cars from the game, Nicktoons Racing, but I'm having some serious trouble trying to port the characters into the game. For example, I plan to port Tommy Pickles from Rugrats (as seen below). But I'm having problems with turning his body parts into skeleton joints for the p3d editor. If anyone knows what to, please let me know. If you have Blender. Assign the appropriate vertices to the Vertex Groups. The groups have to have identical names to the skeletons in the p3d file. Export as an xml file (you'll find the converter tool on this site's resources). Use an already existing character file as a template. Import the xml to the character mesh. Go to composite drawable, and edit in a new window. Right click the display and hit skeleton joints. Right click the bones in the skeletons and click offset positions to move them until they match the mesh. That should do it. Let me know if you have anymore problems. TheFunHero There is something else I need to know. Do I need to do Origin to Geometry when editing character models in Blender? There is something else I need to know. Do I need to do Origin to Geometry when editing character models in Blender? Nathan Steel I wouldn't recommend it. It won't do anything, but having the origin at their feet does make moving, rotating, and scaling easier. I wouldn't recommend it. It won't do anything, but having the origin at their feet does make moving, rotating, and scaling easier. Okay, and another thing. I got this error. It means one of your vertices wasn't assigned to a Vertex group. Fixing this is pretty tedious. Create a new vertex group that you're not using and start assigning sections of Tommy to that Vertex group until that fixes the problem. Then you'll have some idea of where it is. To be more thorough, select weight paint and view the Vertex groups for irregularities. You can also find which weights a Vertex has in the transform tab. Keep in mind you may have multiple vertices without weights so the error may still pop up with a different vertices number. TheFunHero Okay, and if I can't figure it out, I'll just start over from the beginning. Okay, and if I can't figure it out, I'll just start over from the beginning. Nathan Steel It'll take a while but it'll take quicker than restarting it. Odds are you'll miss a vertice that time as well. It'll take a while but it'll take quicker than restarting it. Odds are you'll miss a vertice that time as well. TheFunHero Okay. Do I need to give the vertex group a random name or something? Okay. Do I need to give the vertex group a random name or something? Nathan Steel It needs a name found in the skeleton or you'll get an error. Something like "Extra_Attributes" will work. It needs a name found in the skeleton or you'll get an error. Something like "Extra_Attributes" will work.